No more dangerous ladders for me! What a great product at such a reasonable price! A wonderful and very useful product! This product is very useful, it keeps me from having to get on a ladder to clean my ceiling fans, therefore, I don't take a risk of falling. It just does the fan cleaning job easily and safely. I'm 5'4" and this was super convenient to use to reach my fans. Cleans well. It took me just a few minutes to figure out I had to tilt the duster to get it more easily on the fan blades. After that it was a breeze. Cleaned each ceiling fan in less than 10 minutes. Had no problems with the quality. What a great and handy find! This is also great for more than dust. I use it wet with some cleaner for the blades that are really dirty. I love that I do not have to climb up ontop the bed or a step to try reaching the blades or have extra clean up to the floor because the rag I used just moved the dust from the baldes to the floor. I love this gadget. Just be careful when you are learning to wield it. I tugged on it unknowing that there were weights glued to the top of one fan blade and broke it - boo hoo. I did order another one, however. We have three ceiling fans and I am a short person, we bought the brush to reach those high places and it works great. When I first got it there was so much dust on the fan blades I had to vacuum the floor under the fan. If used more frequently the fiber holds the dust. It picks up the dust nicely. Due to joint disease I am not able to reach overhead-with the extension handle, I was able to reach the fan blades with ease. I have very high ceilings and the fans are hard to reach but with this item it was no problem at all. Does a very good job with a "once over" of each blade, then just vacuum up the "dropping". without using a chair or ladder. This cleaner works great but is a bit on the flimsy side. First one I purchased lost one of the rollers and the tightening nut broke way too easy. Now my ladder can stay in the garage and no worry of falling.Great cleaning tool!!! didnt relize at first that it had a opening in the middle one roller on each side of the fan blades but after that cleaned up the fans both and air moves a lot easier than before. only thing is washing it off have to clean up dust from the rollers and wash off the rollers no catch the dirt pan. Sure is alot easier than standing on a chair or step stool!! Finally able to dust the top of the fan blades without using a ladder. This was great the reach was right on! Great help for those ceiling fans! I liked the ceiling fan duster the second I used it. I believe spraying with furniture polish beforehand would be even more helpful in getting all of the dirt. The extension is great, too. Makes keeping the dust off the fans easier. This ceiling fan duster did do what it was advertised and did clean the fan blades well. It is telescoping, so it will reach the blades. My only problem with it, is that it is flimsy. It tends to bend easily. But, that said, I would order another, because the price was right. Agreat concept that was too lightweight to do the job it was designed for. It does clean ceiling fans, something we needed to have done, but it's 'ightweight construction caused it to keep coming apart during the cleaning process. I still had to climb up on something to get it atached more effectively. Did not clean sides of blades. Kept slipping off th blades. I was not as happy with this as I wanted to be. It did work,but not as well as I expected it to. Was a bit difficult to maneuver. The first time I used it; it came unglued. After gluing it, it works alright. it was difficult getting it on the blades. the slot could be bigger to make it easier to use. it was a little awkward getting it on the blades. the slot could be a little bigger on order to work better. one clamp broke after a few uses but can use it still. This is a handy cleaning too, but for the price the quality is very poor. Dinky and cheaply made, but handy for as long as it lasts -- which is not very long. Should be a better quality or they should charge a lot less than $10 each for this product! While it served the purpose, it could be a bit more sturdy on the roller. Rollers could also be lengthened about another inch at least. I used it to clean my ceiling fans. it is easy to use, but hard to get the dust out of the tool. Difficult to keep the blade motionless. I like it ! It's taken me awhile to get used to it. Took me awhile to figure it out. Am handicapped awhile to figure it out. My balance is awkward, and I am short. Wish I was taller that would help me with the strength in my arms. I am over 50+ of age ! Unfortunately, I am too short and too old to risk using a ladder to reach the ceiling fan on my cathedral ceiling. It is not the product's fault, I thought that the additional 45" would be enough but it isn't. I guess I will just have to have someone come in occasionally to do it for me. If it wasn't for the built in dust catcher it was half decent for the price however the built in catcher is the plastic cover it came in and kept falling off so dust was flying all over….. I was not a happy camper. The product is a good idea, but too cheaply made. it does clean the dust off, but it's not easy to do, you have to try to hold the blade and control the handle. No more standing on a stool! This is great for general touch-up dusting in-between major cleanng, but in the kitchen where the dust is heavier due to cooking, it barely touched the dust. It is not sturdy and fell apart. but for touch-up dusting, it works well. Very difficult to use and dust flies everywhere when using it. The handle does expand to make reaching the fan easily, but the pad is too short and comes off the blade often. It is hard to clean the whole fan blade. Item is very flimsy. Handle has no bracing once it is extended. Ours broke the 1st time we tried to use it. I was very disappointed to say the least. This is a waste of my money. The rod would not hold tight, dust was going every where, made a Mess. Forget this Item, do no send it out to anyone else. I had such high hopes for this product and was so disappointed. Broke first time I tried to use it. used to clean ceiling fan blades, nothing is great about it, it was a cheep made product broke the first time I used it & the thing on it that was suppose to catch the fall off well what can I say, it did not. It's a piece of junk is what it is!!!!! got what I paid for. broke before I could use it. while using it .. it came apart, the cleaning brush was on the fan blade while the handle was in my hand. I would not buy this again. Makes a big mess. THIS PRODUCT IS A WASTE OF MONEY. IT IS FLIMSY AND USELESS. When I pulled it out of the package it was all ready broken. The screw down part that holds the two poles together would not tighen. When I did try to use it on the fan blades it was difficult to use. Finally on the 3rd fan the two brushes broke in half. It found its way to the trash can. It was a waste of money.I was extremly disappointed. Don't waste your money. Disappointed in the product. Small and cheap. Don't judge a book by it's cover best fits this product. This falls apart easliy! Which makes it difficult to clean you ceiling fans when the handle comes off and the top part is still on your fan blade! You have to get up there anyway might as well do it old school and use a rag! It broke the first time I used it! This is a great tool when it doesn't fall apart. I've had one for 15 years and it just broke; I want Walter Drake to replace mine free of charge and shipping. Then I'd like to place another order. The first time I used it, it cracked. Couldn't return it because the box had been thrown out. Completely worthless - came apart each time it came off a fan blade - so happy it was inexpensive. Please don't waste your money. fan requiring a stool to remove. this product broke the very first time I used it. If possible I would give it -5 stars. Save your money, do not buy this product. Poorly made. Flimsy when fully extended; difficult to use on vaulted ceiling fans. Very disappointed with ceiling fan cleaner. First the blades keep moving, second could not get brushes on fan Did two blades and it snapped one brush off the head. The only good thing about it it's a great concept, but too cheaply made. The rollers on the ceiling fan duster were way too close together to get the fan paddle between them. As a result, the rollers fell apart because there was only a plastic piece holding them together. I was very disappointed in the quality and regretted wasting my money on it. This product was difficult to use for many reasons. It's hard to get the blade between the duster. The duster head falls off the pole. I'm very disappointed in this product. It will be donated as it would not be worth the postage to return it. broke before I could even use it...very thin plastic....cost more to return ...so definitely not worth it! BROKE THE FIRST TIME I USED IT. THE PLASTIC IS NOT VERY STRONG. NEEDS TO BE REPLACED. Junky. Poor qauality. Tried to put it together and then used it to dust. Fell apart. I was excited to get this, but was totally disappointed when I tried to use it. In the extended position I could not get it to slide over the fan blades. It is so flimsy that the extended shaft tends to bend and only pushes the fan in circles. I'm back to climbing up a ladder and holding the blades steady in order to use this device. I clean houses for private clients as well as my own. Tried it on my own fan first and the brush distingrated with each swipe..fluff all over making a bigger mess than when I started. I would have returned it but didn't want to spend the postange. Fan is very poor quality, it falls apart before you could use it. Sorry that I spent the money. I'll have to say this is one of the most useless products I've ever purchased. The concept is fine, but the product itself is cheaply made, won't stay together - it fell apart the first time I used it, and I wouldn't recommend it to anyone! As I have said it broke the first time I used it. This is such a piece of trash,don't waste you time or money. It's handle is too flexible for the job.....and it comes apart easily. The idea behind this product was great! you are going to loose customers , because of the flimsy handle, it does not stay locked in length, the blade cleaner should be a bit wider maybe 3 in. for some of my fan blades.All in All, this item is USELESS . I WOULD NOT EVEN RECOMMEND IT TO AN ENEMY!!!! I was very disappointed in this. It was flimsy and the brushes were too close together to easily fit over the blades. The handle broke the second time I used it. PS - it looks nothing like the picture. Sorry, I trashed this item the first time I used it. It is a piece of junk and should be pulled from the Miles Kimball catalog. I would have sent it back except I refuse to waste any more money on it. The plastic tray if you can call it that catches on the end of the fan, so I still had to use a ladder to slide it on the blade and even then it didn't clean well. Broke after the second time using it. The materials are very cheep, would not recommend it to anyone, better of to melt down the plastic and use for Lego's, instead of a ceiling fan duster. The handle would not stay up, the fluff fell all over the thing broke within a half-hour and never did get any cleaning done. Save your money. 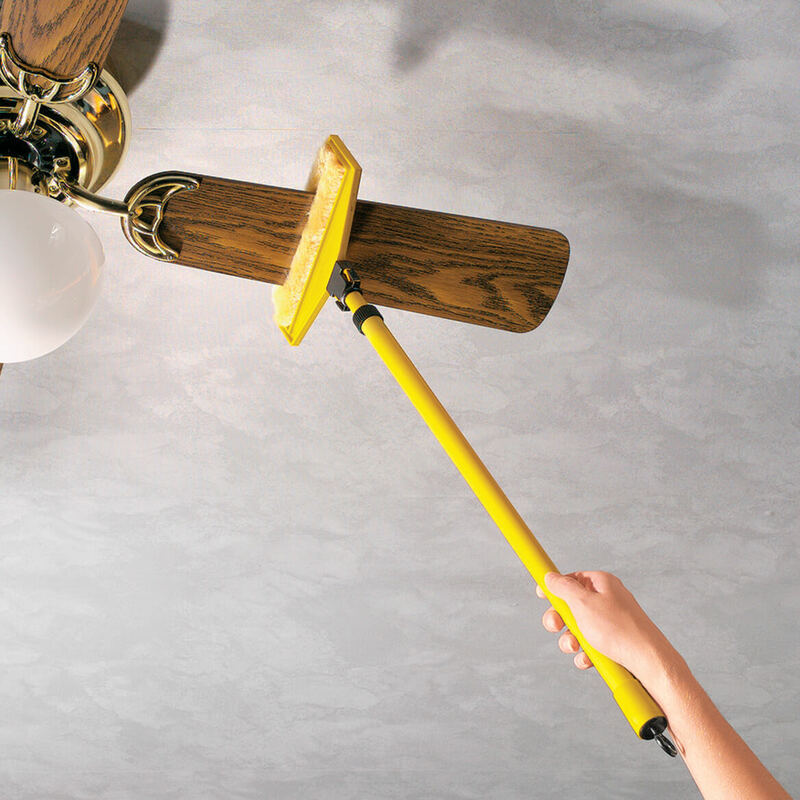 To clean ceiling fan blades. Did not do the job, very poor product. There is nothing great about this product, Iwill be returning the product. It doesn't clean like it should and the cheap plastic dust catcher that comes with it is pathetic. I bought one for my daughter and she felt the same way about the product. Did not lock together at all. Got stuck on the fan blade, is very flimsy and the duster part was so thin and tight that there was no way it would do a good job! Price was marked down, so I tried and now I am stuck with it, because it would cost me more to return it in postage. Do everyone a favor and remove it from the catalog. Idea is good but item not made right. The head of this item does not snap onto the handle. Was set a second one and I had the head part shaved a little in order for it to fit in the handle. Not very strong. This item broke at the connector part the first time I used it. I ordered a replacement and the same exact thing happened. It is not well made. The roller unit kept coming off the handle as I tried to clean the fan blades and it didn't really appear as if the rollers were even rolling. To cheap doesn't hold together. It would not snap together, so I'm going to glue it. Cannot re-use the rollers.Cheaply made. Very disappointed in product. A stupid purchase.Would not recommend. Worse product I've ever bought anywhere. Broke the first time I tried to clean ceiling fan and not fixable. Very cheap, weak plastic. Totally useless! Would definitely return but it would cost too much. Will just throw in the trash. Don't buy this product. It broke when I tried to put the handle onto the brush. Was not able to use it even one time. Very cheaply made with light weight plastic. Not as good as it looks. I have always received good products from Miles Kimball; however, I was very disappointed in this ceiling fan cleaner. I have arthritis and thought this would help me out a lot; however, it was very difficult to slide the cleaner over the fan blades. Once I did get them on the blades, it did not clean very well at all. It left most of the dust on the blades. I think I will stick with trying to climb my step-stool or using my vacuum extension. Thanks, but no thanks. The head on this product would not click on and it kept falling off. I used on two ceiling fans and decided it wasn't worth the money. Am sending it back. It broke the first time i used it the yellow clip part broke. Clip that attaches to handle broke the first time I put it on. Never got to try the product out. Did not return because the cost to return was not worth it. I found it to be flimsy which made it difficult to use on ceiling fans. Broke second time I used it. Refuse to pay for order. The only thing that was decent was candy. Everything else is poorly made and very cheap looking. this item was not worth the money. It comes about too easily and had to get a step ladder in order to retrieve the attachement off of the fan blade. Miles Kimball will not take it back now since it has been used. Thought this was what I needed. Not. This will not hold up to cleaning fan let alone stay attached to the handle. This was another terrible purchase. Very cheaply made, flimsy plastic. I was very disappointed in most of my purchases this time around and will be hesitant to hop with you again. I would not buy this item again!! The picture looks great - and the handle does extend high up - but pads are not good. They don't stay on the fan blade well - continue to slip off. Its VERY HARD to get this on the blades. I gave up and will be sending it back!! It is next to impossible to slide the fan blades between the brush. Then it is impossible to slide the brush all the way to the center. The brush does not stay on the handle. The "clamps" remain loose and the brush just falls off. It was not worth the price I paid. I would like to return this and get my money back. I was very disappointed with this product. The "dust catcher" is the plastic it was packaged in. The cleaning head disintegrated into a handful of fluffy yellow lint. The rollers are very closely and tightly together making it hard to get over fan blade. I haven't really been impressed with any of the ceiling fan cleaners I've tried but this is probably the worst of the bunch. Trying to get the fan blade in between the opening was very difficult. The felt on the top started coming off right away. I was hoping this would do the job but was very disappointed. absolutely worthless, not even worth sending it back as the return shipping would equal the cost so I will just have to live and learn and remember what walter drake sells. Broke as soon as I was taking it off the blade. I bought this product with high hopes. When I first used it, it broke on the first blade I didn't put any pressure. I would never buy again. The first time I used it on my ceiling fan it broke! I chose it to make cleaning my ceiling fans a lot easier. This should make dusting our ceiling fans easier & it was a good value. Won't have to stand on a ladder to clean blades. 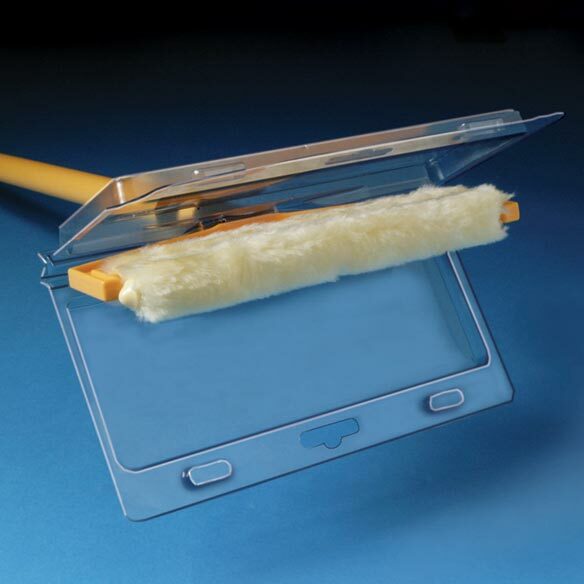 It'll make cleaning my ceiling fan blades easier to clean, without making a mess. Thought it would be easier to clean fan blades. I Don't use it. Had back surgery and I can not climb on something to clean. This will extend my reach. Very handy without climbing ladder! I've had one in the past and they are wonderful at cleaning the gunk off the blades. Glad to find another one! Hoping this will be easier to use to clean my ceiling fans besides standing on the bed trying to clean the blades without falling off the bed. I have a lot of fans in the house and this item works great.. I do not like climb up on my step stool any more, so this looks so much easier. Needed to clean my ceiling fans. I am handicapped and cannot use a ladder. Have used this product before, and needed another one. I hope this will work to help me clean my ceiling fan without climbing on a chair or stool. does it have an extension for high ceilings? BEST ANSWER: Thank you for your question. 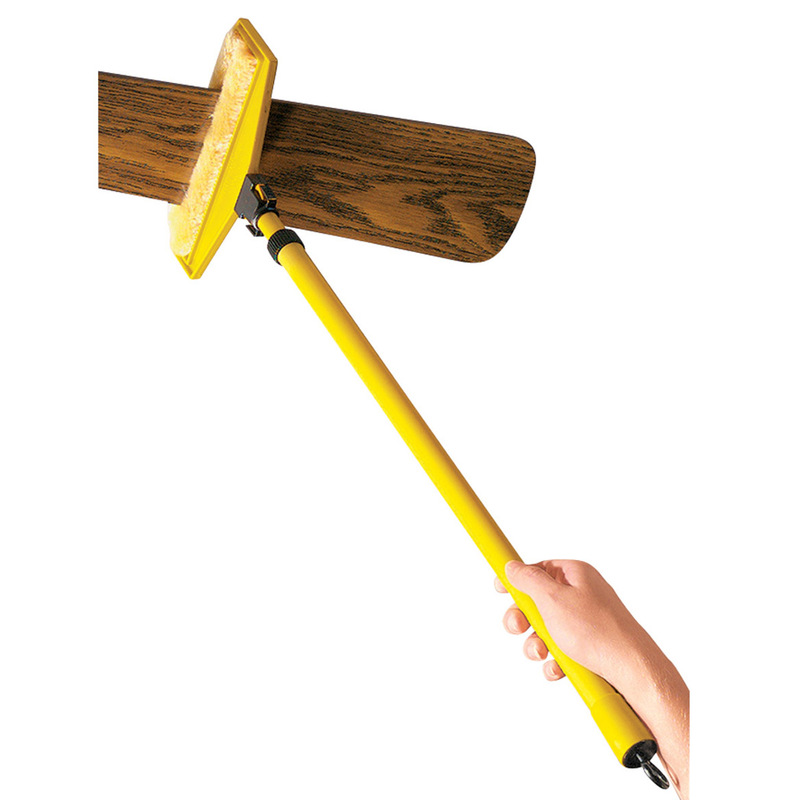 The Ceiling Fan Cleaner extends to 43" and does not come with an extra extender. We hope this information will be of help to you. What kind of cloth is it that cleans the fan ? BEST ANSWER: Thank you for your question. This item has soft bristles for cleaning.We hope this information will be of help to you.